The Earth's size has been exaggerated in this view of the solar system as seen from the north, so that its night and day sides can clearly be seen. In March, the constellations off the left of the screen are visible at night, while those off the right side are in the daytime sky and blocked by the Sun. Have you ever wondered why most star patterns are associatedwith specific seasons of the year? Just why, for instance, can evening skywatchers in the Northern Hemisphere enjoy Orion the Hunter only during the coldwintry months? During balmy summer evenings it is not Orion, but the stars ofScorpius, the Scorpion, that dominate the southern sky. Spring evenings provideus with a view of the sickle of Leo, the Lion. Yet on fall evenings, it's theGreat Square of Pegasus that vies for the stargazer's attention. The change is subtle. Were we to watch the night skyon any one night from dusk to dawn we would notice certain stars rising from above the easternhorizon in the evening hours. They would sweep across the sky during the night,finally setting beneath the western horizon by dawn. No big deal here, since,after all, the sun does the same thing during the daylight hours. It's causedby Earth's rotation. But with the passage of time, we would notice somethingrather puzzling. Those stars that were low over the western horizon duringthe early evening hours would, within a matter of a few weeks, disappearentirely from our view, their places being taken up by groups which a few weeksearlier were previously higher up in the sky at sundown. In fact, it would seemthat with the passage of time, all the stars gradually shift westward while newstars move up from the eastern horizon to take their places. But just why is this shift happening? If we were to synchronize our clocks using the motions ofthe stars as a reference we would discover that the Earth would complete asingle turn on its axis not in 24 hours, but actually 23 hours and 56 minutes,or four minutes shy of 24 hours. This would be a day based upon the apparentmovement of the stars in our sky, which astronomers call a "sidereal"day from the Latin word for star. 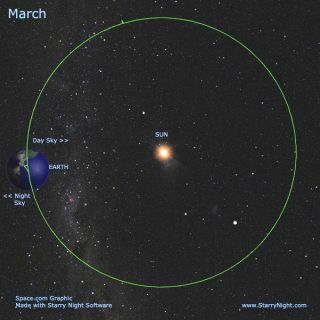 While this is happening, all of us are being carried aroundthe sun on an annual journey almost 600 million miles long. Our orbit is almosta circle and as seen from the sun the Earth would move about one degree eachday, since we take about 365 days to go around a circle of 360 degrees. As seenfrom Earth — from our vantage point — the sun seems to move and it changes itsplace in the sky by that one-degree per day, as measured against the backgroundof stars. Of course, we can't see the stars in the daytime butastronomers can measure the position of the sun. The direction of the sun'sapparent motion is eastward among the stars. Since the daily turning of the sky(caused by the Earth's rotation) appears to move westward, this slight motionof the sun is what makes a day as measured by the sun (called a solar day)longer: the Earth must turn about one degree (or about 4 minutes) more than afull circle to complete a 24-hour day as measured by the sun. That slight shift each day is what makes the different starsand constellations appear at different times of theyear. The sun slowly changes its position, but so slowly that the starswhich are up when the sun is down also change. If you want to try an experiment, look outside some clearevening from a location you can find again. Notice the exact time that aparticular star is directly aligned with some object, like a telephone pole ora roof. Look the very next night; stand in the very same place and the starwill be there four minutes before the time it was the previous night (of courseyour clock must be set accurately each night). You are observing the effects of the Earth's motion aroundthe sun. At this point you might be a bit confused. If the Earthtakes 23 hours 56 minutes to turn on its axis, why do we say that a day is 24 hourslong? Astronomers have devised special clocks adjusted to keeptime solely by the stars. These astronomical clocks keep sidereal time. Thereis no a.m. or p.m. in a sidereal day. With the clocks that we use every day, the hour hand goescompletely around 12 hours twice a day. But with a sidereal clock, there are 24hourly numbers on the dial instead of 12 and the hour hand goes around onlyonce in a sidereal day. The hours start at 00 hour (zero hour) and are numberedstraight through to 23 hours and then starts at the zero hour again. The otherdifference is that the sidereal clock runs four minutes fast as compared to aregular clock. Now, if our daily lives were governed by the sidereal clock,there would be times during the year when thesun would appear highest in the sky at noontime, but at other times of theyear it would appear highest at midnight or setting at 6 a.m. (or somethingelse strange). We're accustomed, of course, to being awake when it's light andasleep when it's dark, so astronomers also have developed a "mean"sun — which is fictitious and for most of the year deviates somewhat from thesun's actual position in the sky. Yet, the mean sun governs our ordinary clocks and results inthe 24-hour time scale of which we have become accustomed to all of our lives.